The following article, by Khaled Barakat, was originally published in Arabic at Quds News Network on 18 January 2019. Palestinian writer Khaled Barakat is the international coordinator of the Campaign to Free Ahmad Sa’adat. The leader of the Popular Front for the Liberation of Palestine, Ahmad Sa’adat, does not cry out from prison to complain about his own conditions. He asks nothing for himself except books and some pictures of his family. But we, his friends, comrades and supporters, can and must shout for him, at the very least. This could be described as a challenging time for the Palestinian liberation movement, when the cause and its solid revolutionary core (the Palestinian prisoners’ movement) are subject to escalating Zionist attacks, backed to the hilt by an unparalleled American alliance with Arab reactionary regimes. The Palestinian people and their strugglers in the Gaza Strip are confronting with all forms of resistance the most well-armed force in the region. 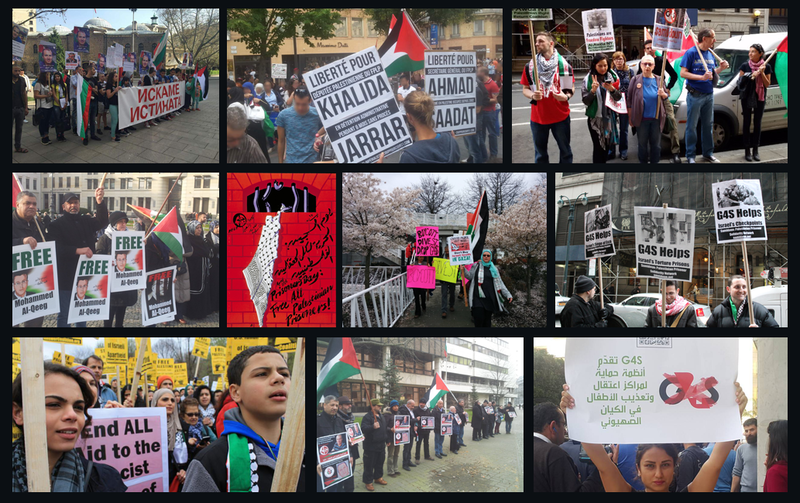 At this time, movements of solidarity with the Palestinian people are active in many countries of the world. On this occasion, they are organizing the International Week of Solidarity with Ahmad Sa’adat, for the freedom of this imprisoned national leader. He resembles his people and their exceptional strugglers; he brings to mind the pain of the forgotten, suppressed refugee camps, the voices of the Palestinian popular majority, forced under the wheel of occupation and colonialism and into the fires of a regime of total oppression. The true character of a person can become clear at the most severe moments of challenge. In the case of Ahmad Sa’adat, he has faced a daily test in interrogation rooms and torture cells since 1969, when he was first arrested as a rebellious Palestinian boy on the streets of Ramallah and its camps. Since then, Ahmad Sa’adat, a student at the school of Al-Hakim (George Habash), has always stood firm in each stage of challenge, succeeding in passing the tests – and revealing the essence and meaning of the freedom fighter. This true character is apparent under the sun, in the time of isolation, exhaustion and retreat, not in the moments of progress, advancement and forward movement. It appears at a time when the situation degenerates, the leadership has no political compas, and there is instead much talk of “peace”, “reconcilation,” and adaptation to the conditions of Zionism and colonialism. In these periods, the intellectuals of the defeated authority also strive, without being pursued or imprisoned by the enemy, to convince the people that they see a rose garden ahead when the Palestinian people know that there is only a dustbin ahead. The real nature of the revolutionary fighter is shown when their ideas and will are tested on the harsh rocks of reality, which does not lie and is only biased toward the truth. These are important moments in the history of the peopl, the party and the national liberation movement. “I do not have the right to forget or be tired. I do not have the right to complain,” Ahmad Sa’adat told us in a private message. Forgetting, in the Palestinian situation, is more than an error or a lack of follow-through. It is the equivalent of death, acceptance of defeat, submission and its conditions, a betrayal of the very fundamental questions of Palestinian existence. Forgetting is the secret scourge of those who submit and collude with the occupier – and an active and public participation in its crimes. It is the poison of the enemy and its daily weapon, providing the arguments and pretexts for surrender. Perhaps this is why you find a phrase on the walls of poor Palestinians, in the camps, in the village and in the prisons: We will not forgive and we will not forget. This stubborn insistence on preserving and protecting Palestinian collective memory and popular consciousness, this steadfastness in defending the cause, is the inspiration to a fighter in a difficult time. And it is a humanitarian and revolutionary value that confirms the meaning of loyalty and commitment to the path of the martyrs, the comrades and the captives who came before, who lived, who will be born, some of whom will never be known. How can his comrades forget Mohammed al-Khawaja, when he remained firm on his last cold night, declaring “confession is treason?” How can Ibrahim al-Rai be forgotten, when he went to death smiling to protect the secrets of his comrades? And Khalil Abu Khadija, Mustafa al-Akkawi, and hundreds of comrades who refused the shackles on their wrists and would not adapt to their conditions. They said: “No.” In a difficult times, without greatness or clarity, how could we forget the leader or the human, or grow tired of the struggle? Comrade Ahmad Sa’adat shows us the experience of true leaders, the existence of a revolutionary and alternative Palestinian leadership of a different type inside the Zionist prisons. A national leadership born from the womb of the people, born of revolution, intifada and experiences of struggle, a leadership that looks like the Palestinian people – and not like the “brigadier general,” “the colonel,” “the president,” “the minister” or “the ambassador.” A leadership elected through struggle and suffering that derives its legitimacy from higher and more important ethical sources than the Authority’s elections and its confiscated insitutions. Yet, shamefully, those without true political authority, occupy the Authority with authoritarian practices from the palaces of Ramallah. Ignoring this bitter Palestinian reality or abandoning it in difficult times is a disgrace, as it provides all authority to palaces, bank owners and corporations, while it deprives the camps, subjecting them to punishment and liquidation. There is a close relationship between the camp and the prison; there is also a close relationship between the palace and the treasonous authority. The leaders of the national liberation struggle, with revolutionary conviction and steadfastness in the face of the Zionist enemy, also show the highest levels of democracy, flexibility and compassion in dealing with internal issues, in understanding of people’s conditions and situations. On the other hand, you can find that most of the leaders of normalization and security coordination with the enemy are the most harsh and dictatorial in their relations with the masses, within their parties and even inside their homes. As Palestinians we say: they are soft doves in front of the enemy, and a lion in front of you! The national leader Ahmad Sa’adat and dozens of his fellow leaders and strugglers in the occupation prisons represent a unique and important model in this Palestinian context. They are imprisoned because the colonizer fears them. This is a fact that must not be forgotten. The issue is not simply that of a person. Instead, the occupier knows that the prsence of these people outside the walls of the prisons, leading the daily struggle, means a change in reality, their noble principles becoming the rule rather than the exception. It is always in the interests of the enemy to deal with a corrupt, ineffective “leadership,” always prepared to fight for its small privileges and crumbs from the rulers of oil and capital. Why do we not see mass popular demonstrations in occupied Palestine and the Arab homeland against the Zionist onslaught on the prisoners’ movement? Or on the anniversary of the kidnapping of the leader Sa’adat and his comrades, which passed without such any action? This is a burning, logical and legitimate question, yes. But it is also a collective question, and the answer requires work, not mere words or excuses. This is a question for the entire Palestinian national movement, and at the heart of it, the comrades of Ahmad Sa’adat, first and foremost.